Location: The screen stands on the skyline at the Llwyn-y-Cil entrance to Chirk Castle Park at the end of Station Avenue, and set back from the right-angled bend. Centre part (without piers and side screens) was begun in 1712; designed and executed for Sir Richard Myddleton, 3rd baronet, by Robert and John Davies, ironsmiths of Croes Foel, Bersham. This was incorporated in an enlarged scheme of 1718-21 by the Davies brothers for the forecourt screen to the Castle. The centrepiece (with gates lengthened) and short lengths of side screen were moved in 1770-1 to New Hall Lodge entrance to the park. Resited, with the screen lengthened with additional panels on the present site in 1888 after the closure to wheeled traffic of the old Cardiff to Chester road through the park. Intricate cast and wrought ironwork, painted black with gold highlights. Composition of massive openwork piers with sedent wolf finials in lead, twin carriage gates with side panels and rich heraldic overthrow containing the Myddelton arms. Flanking pedestrian gates; screen railings on dwarf ashlar walls with roll-moulded copings and outer stone piers with acorn finials. Exceptional ironwork detailing includes Corinthian capitals to open piers incorporating vine tendrils and coronets with balustraded bases. Scrolled supports to heraldic overthrow embellished with bird, flower and foliage ornaments; urn finials and sunburst supporter to top rail. Intricate scrolled foliage, masks etc to carriage gates; spear finials and simpler scrollwork crestings to side gates and railings. 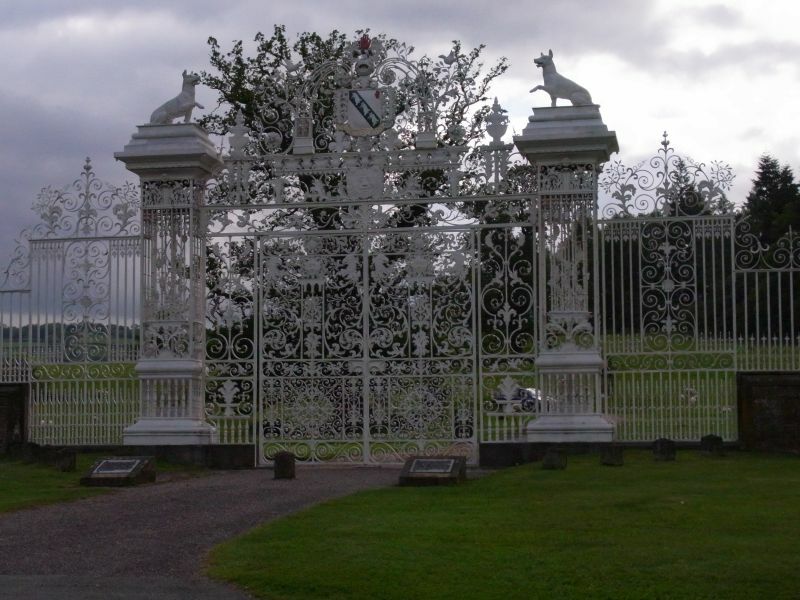 For much of their life, the gates have been painted white highlighted with gold. Gates removed for repair on inspection, January 1998. Included at Grade I as regarded as the finest of all the Davies brothers ironwork, and comparable to Jean Tijou's work at Hampton Court. The lodge stands within the gates, on the N side and facing the drive. The reservoir is in Reservoir Wood, S of Station Avenue, and E of the S extension of Llwyn-y-cil Road to the caravan park. The building stands on the E side of the road, raised on a bank, with the former farm barn to the N.
The pair of cottages stand parallel and set back from the road N of Llwyn-y-cil Cottage. The house lies back from the road in its own grounds, with access off the road from Castle Road to Station Avenue. II* Chirk Tunnel, including the N and S Portals, and Chirk Basin. The Chirk tunnel continues the canal N from Chirk basin at the N end of the aqueduct, and is reached by a path from Castle Road. The bridge carries the road from Chirk to Weston Rhyn across the Afon Ceiriog.